Ramsha Khan has worked her way up to becoming a star player on our TV screens. The young actress has a striking screen presence, due in part to her natural attractiveness and her versatile choice of roles in her career so far. The critics have raved about her performances, and though she hasn’t been in the industry for long, she is already a master of her craft. As an actress, she has starred in critically acclaimed dramas and has shown she is equally adept to playing characters that are poles apart. She has become a household name for her roles in the hit drama serials currently on air; Khud Parast and Kaisa Hai Naseeban. As the headstrong, type-A girl in Khud Parast, Khan has the audience emotionally invested in her character as she faces the hardships of married life, giving us one of the stand out performances of her career. With her harrowing and exhaustive performance in Kaisa Hai Naseeban, Khan has done justice in her portrayal of a marital abuse victim, selling every aspect of her role effortlessly. She portrays both characters with such ease, making it hard for us to keep our eyes off screen with her heartfelt performances. Her antics and the talent of creating a memorable character on screen have helped her bag such diverse roles. 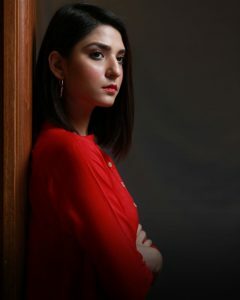 Ramsha Khan has always managed to choose roles that are worthy of her particular talent, from the slightly evil jilted fiancé in Woh Aik Pal, to the shy and sweet girl in Kaisa Hai Naseeban, her characters are a testament to how malleable she can be, with the genre jumping she has successfully managed to do. Anger comes to her as easily as kindness, and her diverse roles are a proof of that. If it wasn’t for her charismatic presence on screen, the roles she has played would be a faint memory.